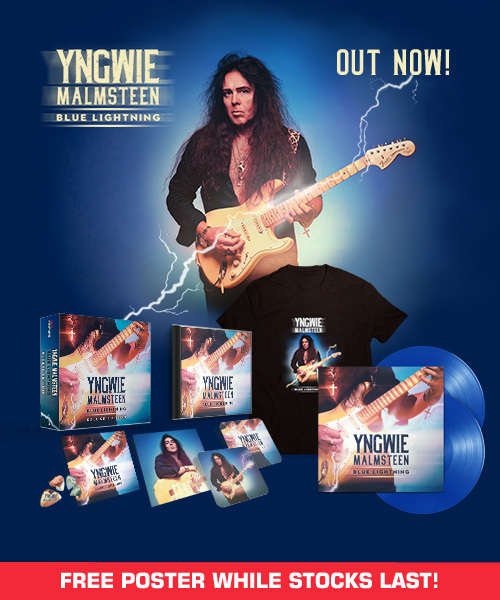 The new Yngwie Malmsteen album Blue Lightning is out now! Blue Lightning, by the incomparable Yngwie Malmsteen, is available worldwide on CD, vinyl and digitally. With Blue Lightning, Yngwie Malmsteen highlights not only his enduring dexterity and diversity, but also pays homage to those from the blues and rock worlds who have fuelled his artistic spirit for so long. Anyone who is expecting Malmsteen to copy exactly the way the original versions sound is in for a shock. Because that is not what he has done. He has masterfully transformed classics like Smoke On The Water, Purple Haze and While My Guitar Gently Weeps into his own inimitable style, and wrote and recorded 4 new tracks for this album. Available from the MLG store, with a free Yngwie poster, while stocks last!